Joints, bongs and plenty of smoke accompanied the thousands who gathered at Queen’s Park to march in favour of legalizing marijuana on Saturday. The 13th annual Global Marijuana March was organized to celebrate marijuana for both medical and recreational uses. Matt Mernagh coordinated the Toronto chapter of the event after recently winning a court battle to be able to grow marijuana in Ontario. Roy Bowins, an event participant, says he has smoked marijuana since the 1960s and that the big push to legalize marijuana has changed. “The price has certainly changed, but the popularity keeps growing,” he said. 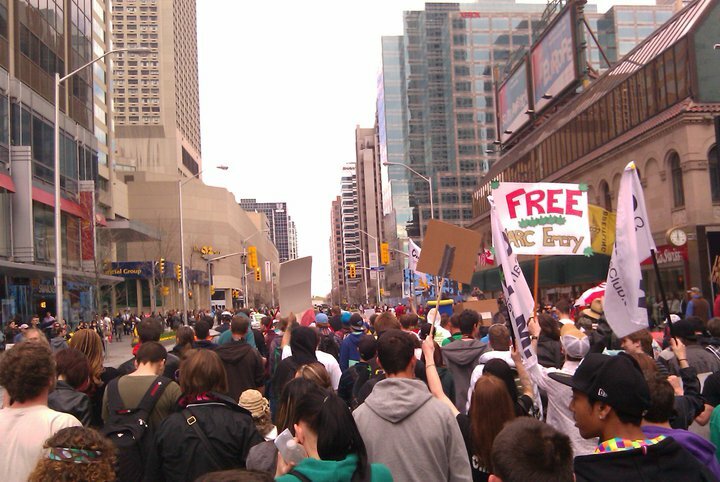 The Toronto event was the largest gathering in the Global Marijuana March series. Neev Tapiero, an organizer of the event, said it’s because Canadians love cannabis. “One of 15 people consume it at least once a month and it represents about 10 million Canadians, so 10 million Canadians aren’t criminals,” he said. Event participants said it’s past the time to change the marijuana laws in Canada, but with a newly elected Conservative majority in power, they said there isn’t much hope in having the law changed. “Cannabis isn’t like the other drugs so [there is] nothing wrong with getting tough on crime but don’t get tough on cannabis. Cannabis is different, it isn’t a crime,” said one event participant. Naomi Poley-Fisher, a legal marijuana user, says she is concerned about what the future holds. “I’m a so-called legal smoker and my grower is a legal grower, but the minute that card expires, we’re not. So where does that put us in this government that is so anti-cannabis?” she asked. I think we had a Releaf Member at this event. Eat a peppercorn… You’re too high.